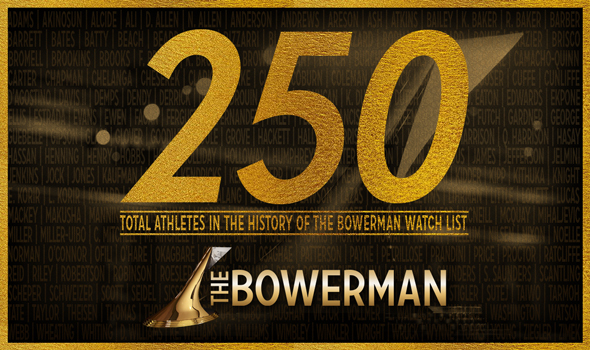 The Bowerman Watch List hit a milestone yesterday. Since the index debuted in 2010, there have been a total of 250 athletes – men and women – who appeared on its pages in the past eight years. Earlier this week eight new names were added to the annals of the best of the best in collegiate track & field with the release of the Men’s and Women’s Preseason Watch Lists: Nathon Allen, Cameron Burrell, Justyn Knight, Kemar Mowatt for the men, Mikiah Brisco, Madeline Fagan, Sydney McLaughlin and Sammy Watson for the women. No program has been more decorated when it comes to The Bowerman Watch List than Texas A&M. The Aggies swung ahead of Oregon for the most athletes named to the Watch List with the inclusion of Watson, a freshman standout. Texas A&M increased its historical total to 21, compared to 20 for the Ducks. Florida has 17 athletes on the Watch List over the years, including 13 men. The Gators saw KeAndre Bates and Grant Holloway continue their streak of Watch List mentions with their preseason billing. No athlete earned more Watch List mentions than Edward Cheserek. The former Duck hauled in 29 nods during his legendary career and was a three-time finalist for collegiate track & field’s highest honor. Former Georgia combined-event superstar Kendell Williams holds the record for most nods by a woman with 24. Williams could be surpassed by former teammate Keturah Orji this year, as Orji has 20 and the two-time finalist doesn’t appear to be going anywhere, anytime soon. When it comes to decorated winners, Kimberlyn Duncan has appeared on the most Watch Lists in her career. Duncan, the 2012 winner of The Bowerman, earned her spot on 20 releases. Not too far behind her was 2017 winner Raevyn Rogers (16) and 2016 winner Courtney Okolo (15). Marquis Dendy and Deon Lendore are the most decorated men to have won The Bowerman, each appearing on 14 Watch Lists. Dendy brought The Bowerman back to Florida in 2015, while Lendore captured the honor the previous year. We’re looking forward to adding a lot more names to the registrar this year as the collegiate track & field season takes shape.